Austin ISD chief Meria Carstarphen talks bluntly about the poisonous politics between the state and the district over the bungled “repurposing” of Pearce Middle School (spoiler alert: she blames the state) and how it informs her efforts to reform the city's failing schools. 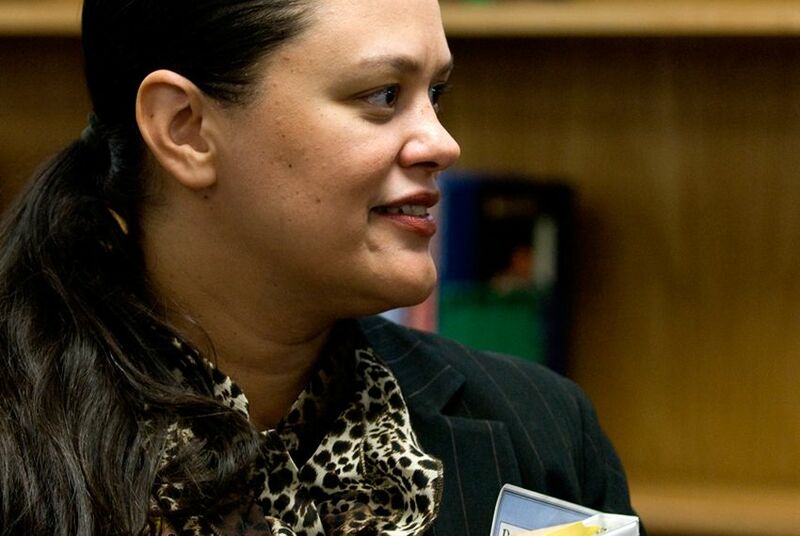 Meria Carstarphen, Austin ISD’s new superintendent, has made the turnaround of the district’s long-failing schools on the city’s impoverished East Side a centerpiece of her tenure. In many ways, she has little choice. A handful of Austin schools have failed to meet state standards, so they either already have or could soon come under state mandates for closure or “repurposing,” which involves transferring the principal and most of the staff. Short of closing the school entirely, that may be the most controversial — and riskiest — move any superintendent can make. Nothing guarantees the new principal and staff will do any better than those they replace. Moreover, the house-cleaning itself makes it that much harder to recruit faculty into the public pressure cooker of working in a turnaround project, under the piercing gaze of district and state politicians, the community and the media. Here are more excerpts from our session with Carstarphen, in both text and audio. (We give Robert Scott a chance to respond to criticism at the end.) Carstarphen was joined by her chief schools officer, Paul Cruz, who answers a question or two. Q: So you had the threatened closure of Pearce Middle School, which ultimately was “repurposed,” dropped on your desk in your first week on the job. How did you handle that? All the politics aside, it was a pretty tough start to a school year. … We had probably 80 or 90 percent of the families at Pearce who I’m not sure they were even aware of what was happening. It’s a community that’s high-poverty, high-need. And our student body there is overwhelmingly Hispanic, with second-language learning needs. So these are families that are disenfranchised from the political process, much less the school process, and I just felt like, I didn’t need to spend much of my time dealing with that part (the politics); I spent all of my time trying to figure out ways to ensure that the school community got the support it needed … These families often need the kids in their neighborhoods to help with siblings; some live with their grandparents; they have very complicated social and personal lives. And so, closing a school in July, in the summer, when no one is around — this is Texas, people go back to Mexico, for goodness sakes — as I said publicly, I firmly disagreed with the decision (by Scott) to close a school that late in a school year. And, of course, with the repurposing required, if you were going to open, you had to rebuild an entire school in one month. Get good teachers — after you already had good teachers who were turning around the school the first time. Get a good principal, who would, not bring their vision, but do the agreed-upon state plan … Under the circumstances, these people (at Pearce) are under extraordinary pressure. I’ve worked in (Washington) D.C., Columbus, Ohio, the Twin Cities, I’ve certainly been exposed to Boston public schools. I’ve seen urban education. And this school was making double-digit achievement gains (in the two years before the state intervention) … Their pure achievement was unbelievable … It was very impressive. What I didn’t take issue with were the facts. We acknowledge this has historically been a failing school. But, if we’re really about achievement or improvement, you can’t penalize them for their past, when for the past few years they have been making a turnaround … These last two or three years you’ve been doing better, but we’re not going to give you credit for that? What’s the incentive to turn around? … (We need to) live in today and plan for the future … They were doing it in a community way. They were turning themselves around. The thing I had great respect for, and that I don’t think should be lost: These are the kinds of things that people criticize communities of color for, that they don’t take responsibility for their neighborhoods, their kids. Q: So you immediately are on a ticking clock to open this school when you first get here. And the way I understand teacher hiring is that, normally, if you’re a principal, you’d like to be picking off the best candidates as early as you can, in February, March and April, and it gets harder the deeper you get into the summer. So where did you turn? We offered incredible incentives; we pulled every stop, including just paying people a lot more than they would in any other school … The principal of the school has a higher performance compensation design than the superintendent. You know, it’s real. (The bonuses, according to AISD’s repurposing plan, are $5,000 for all teachers, with an additional $2,000 available based on student performance; $12,000 for four “master teachers,” and up to $40,000 for the principal, based on performance). Q: But who was on the market at that time, did you do some internal transfers from other schools of teachers you knew were great, or how did you go about trying to get the talent and experience you’d like to see in one of those low performing schools? Chief Schools Officer Paul Cruz: We got some teachers back. Actually a couple of teachers who transferred to other school districts came back in. Every teacher who wanted to come back had to go through a screening based on prior student performance data … We put out the notice about Pearce, the bonuses for performance, had a lot of interest and still went through the regular interviewing process … Some came from within the district. The principal (Trana Allen) came from outside the district. The principal had been in a middle school as a teacher, but was principal of an elementary school that was rated “exemplary” (under state accountability). Q: Realizing you were in a tough situation, did you get the faculty you would have wanted at that school, say, if you had more time to prepare? Q: If you have a situation where you’re trying to limit the turnover, and the solution is, let’s clean house at the school, do those things mesh in your mind? Are there times you would clean house, but it’s case by case? Carstarphen: I would not have done it in this case. I have closed and reopened schools; I’ve closed a school and changed the grade configuration, so a middle school became a pre-K to 8; I’ve closed a school entirely and made it an early childhood center; I have had schools where we kept everybody and everything, but only changed the program … I’ve yet to work in a community where, I’ve gone in and said, these schools are academically unacceptable so I’m going to shut them all down and move 50 percent of the staff and all that. At every school, there is the right solution. You just have to be willing to work for it. Really work for it, and dig for it, and get it right so it can really get stable for the long term. Q: What I’m also hearing you say is that having months of planning is incredibly important in any school turnaround effort. A good measure for that kind of stuff is, before you leave for winter break, you better know everything you’re doing for the next school year. In any school like this, anything less than that time, you’re really putting a lot of unnecessarily pressure and strain … We are not on that cycle here just yet. But we’re working to get there. I’d like to see us on a much more reasonable cycle for those things so you can work on them, budget for them — I still don’t know what the budget for Pearce is. As we found things that weren’t working, we had to put more money in. It wasn’t budgeted for — that much I do know. I don’t think anybody (the state, the Austin school board, legislators, community advocates) even requested a budget. It was, “just keep the school open at all costs.” And that’s a model you can’t afford to run — no district can do it. Q: Since the overhaul of Pearce, you have designed a new and fairly aggressive turnaround effort and invited proposals from all kinds of outside groups to perform “whole-school” or “program-enhancement” reform for other schools in danger of failing state benchmarks. How many and which schools might see these reform efforts next year? Will Pearce be targeted again in this round? It’s no secret I’ve done case studies on five schools. (Pearce, LBJ High, Reagan High, Garcia Middle and Lamar Middle). Now that we have the list from the federal government and the state of (schools eligible for) school improvement grants, and that has opened our eyes to schools that could have resources greater than I could ever afford to have under this model (Up to $2 million per campus over three years.) … (At Pearce) feedback from the school is, they haven’t bought into the design. It’s not particularly appealing. It’s like, they are just getting the job done … LBJ High School has a touch-and-go history, high moments and low moments all the way through its career … The truth is, where the school is today, no matter what, this is a school we need to be intervening to help rebuild the instructional design. It’s gone too long, too far without the right kinds of supports to make it work. Q: Is your “whole-school” reform concept like a charter school? Would your administration hire an operator and give them large amounts of autonomy? Or would they still report directly to your administration? There won’t be any school that’s not under the authority of our school board. They would be taking action to do something like that. Somebody could restructure the design to where they are running the day-to-day operations, but as it stands right now, our board would have to take action to give up that authority. We do know that, if any of these partners want to work with us, there are certain parameters within which we have to live. And some partners might not want to live with that. Q: How much additional investment in these schools is necessary and how much can you afford given the district’s tenuous financial situation? In education, particularly public education, we are the pack rats of ineffective programs. We have more resources than we think we have. We let the politics drive keeping things, even if it drives us into a deficit … “We’ve done this for 15 years, and it serves 20 kids in this, and how could you possibly consider undoing it?” … I’ve pushed very hard all year long, and plan to keep pushing, that we should invest in those things that work and let everything else fall off the plate … And so we are, we’re working with the citizens budget review committee, to look at all the programs in the district to create the right criteria to sunset them if we can’t prove they make a difference. And that’s going to be controversial. I hope you’ll follow us a year from now when we start doing that. It’s going to be a hot time. I can understand why, from her perspective being the new superintendent, this wasn’t the best way to deal with Pearce. But long before her taking the helm at Austin ISD, the district certainly knew the school was in trouble. I think part of this was the outgoing administration was waiting for the incoming administration … But there had been plenty of opportunity for the district as a whole to work on that issue … They knew well in advance that campus was in trouble and they needed to be taking steps to correct it … When you have that many years of poor performance, something has to be done … And, yes, I think it will ultimately be to the benefit of the kids (at Pearce Middle) when the district starts paying attention and putting in some real reform efforts. We wanted to make sure we got the district’s attention and got them focused on the needs of those kids. That’s why the accountability system exists. It’s not just Pearce. There are a lot of schools (in Austin) that need serious attention, and in my comments last summer, I said Austin really needs to take a look at the schools on the East Side, and I think they’ve done that this year. I haven’t had a whole lot of interaction with her (Carstarphen), but she seems willing to make some tough decisions and push the envelop a little bit, so that’s encouraging.